Late, full or partial cancellations will be subject to a cancellation fee. The cancellation fee will apply for each person and each service for the first booked day, or, if the reservation spans over a periodof seven days and more, for the first three nights of the reservation. All increases of the participants' number of the reservation must be submitted to the management for approval. Any legal disputes arising from this agreement shall be settled before the court in Vienna, Austria. A group is defined as a group of guests travelling together and arriving and departing on the same dates. Rates are quoted in â'¬ (Euro). Bed rates are quoted per night including buffet breakfast, service charge and all taxes effective upon conclusion of the agreement. In case that any new government tax is introduced during the validity of the agreement it will be added to the above rates. Balance payable at Check-Out or latest within 14 days after receipt of invoice. In case that down payments are not credited in time, the Hostel reserves the right to cancel the bookings. It is the responsibility of the Client to deduct cancellation fees from the persons making the cancellation, and to credit these amounts to the hostel. A rooming list and detailed meal requirements are to be made available to the Hostel 14 days prior to arrival date at the latest. ·	All reservations, amendments or cancellations are subject to a written reconfirmation by the Hostel. ·	The Hostel reserves the right to withdraw from this present agreement in case of force majeure or any grave violation to the agreement. In the event of force majeure the hostel may not be held responsible for damages. ·	All other terms not mentioned in this agreement are settled in the Agreement on the Code of Contact for Group Travellers issued by the Austrian Professional Hotel Association and the Austrian Professional Travel Agency Association. ·	The contracting partners hereby declare that the contents of this agreement shall be kept secret from third parties, particularly with regard to the booking status and rates. ·	The hostel reserves the right to accomplish accommodation in a hotel of same category. ·	Any legal disputes arising from this agreement shall be settled before the court in Vienna / Austria. Great Choice - Welcome to the 1st hostel in Austria! More than 60 years of tradition! Our facilities include free use of Microwave, Kettle for boiling Water & Refrigerator, however we do not feature a stove or full size Kitchen-utilities. The Youth Hostel Hütteldorf is right on the subway line U4, which brings you in 20 minutes to downtown and in 10 minutes to the Schönbrunn Palace and the Naschmarkt (Vienna's most popular market). The house itself is situated on the edge of the forest, surrounded by numerous walking and bike trails and a large garden. The unique features and the sensational price make us irresistible to every hostel traveler. 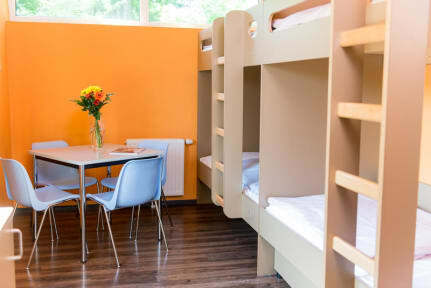 We have 60 bright rooms with 2-7 beds in the traditional youth hostel multi-bed rooms style. Some rooms have shower or shower / WC and all have free lockable cabinets. If you do not have your own padlock, you can purchase one at the reception. There our friendly, multilingual staff stays at your disposal 24 hours a day. There you will also find free city maps, timetables and other information for your stay in Vienna. You can arrive at any time, the rooms are ready after 3:00 pm. If you arrive earlier, you can use our free luggage room. You can watch television via satellite, play pool and tabletop soccer in the lounge, or do your laundry with our own washing machine and dryer. In the small guest kitchen you can prepare simple meals with the microwave and there's also a kettle and fridge. Classic Youth Hostel services at competitive prices combined with environmental protection and sustainability is our philosophy! We are proud to be one of the first hostels to own an environmental label. The hostel was really clean and comfortable. Location is farther out from the city center but a 5 minute walk to the U and it was super easy to get to everything. Would definitely stay again. My adapter was broken, I borrowed one from the front desk, I was asking to purchase the adapter when I was checking out, the superb staff gave me the adapter for free!!!! Really nice place, definitely will re-visit again!! Nice hostel, clean and comfortable. It's far from the city center, but easy to get to by public transport. Would be nice if it had a kitchen, but there's a grocery store nearby. Definitely a great place to stay if you're on a budget in Vienna. Decent hostel - easy to access but out of the city centre. Good if you just want a quiet night but if you wish to be social look closer to the city centre. Location is the end of the U4 line so very easy to get to. This place is really easy to access by train and is pretty clean throughout. They don’t have any cooking facilities though and food wasn’t the cheapest. They have great security and open all day, but there was no real hostel vibe, there was a communal area, but no real effort to bring people together. It was great for the price it was though! Okay hostel for one night but the walls were very thin and you could hear people walking around and talking all night. Staff wasn’t very welcoming and it’s out of the city. Not sure I’d recommend for more than one night.